hand over to Benue State Attorney General for prosecution the perpetrators of killings that recently took place in Benue State. It also called on President Muhammadu Buhari to rise up to the responsibility of his office which primarily is to provide security for the citizenry by halting the wanton killings in the land arising from general insecurity. 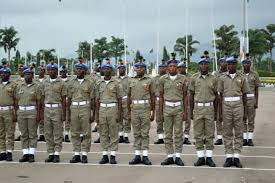 Majority of the senators however called for the establishment of state police and signing of Nigeria Peace Corps Bill into law for purposes of intelligence gathering and adequate security at the grassroots. The senate resolutions followed the consideration of reports of its special ad- hoc committee on security presented to it yesterday by the Senate Leader, Senator Ahmad Lawan ( APC Yobe North). Other recommendations of the committee adopted by the senate were that a national security summit should be convened as a matter of national urgency where the various security stakeholders at the centre would rub minds with the 36 states governors, their Commissioners of Police and Chief Judges for way out of the failing security architecture. It also urged the federal government through the Ministry of Agriculture to as a matter of urgency, convene a special National Council on Agriculture meeting to deliberate on the development and modernization of Nigeria’s livestock and dairy industry. That federal government should immediately re-examine the current deployment of security forces, particularly the Police, DSS and Civil Defence Corp for effective presence in the rural areas starting from the conflict prone areas around Niger, Benue, Nasarawa , Taraba , Adamawa, Zamfara , Kaduna etc . Earlier before the adoption of the recommendations, Senators had one after the other condemned the wanton killings in the land and lampooned President Buhari and heads of security agencies for alleged lackadaisical attitude to the challenge. First to speak in this direction was the Deputy President of the Senate, Senator Ike Ekweremadu who declared that the killings in the land is assuming alarming proportion requiring emergency attention. He specifically revisited the issue of creation of state police which according to him has become very necessary now. He said, “The killings that is going on in Nigeria is assuming an alarming proportion and very disturbing. It is taking the dimension of football competition, where there are matches and return matches. “What we have here in Nigeria are situations of killings and then retaliations as expected. And as a responsible parliament we must rise to the situation by saying enough is enough. I don’t expect us to sit down here and not do anything. Nigerians expect us not only to say something but do something. “This brings me to the most important section 14(2b) of constitution and that section of the constitution is saying that the principal purpose of government is provision of security and welfare of the people. “For us to fill the impart of what we should do and if you read section 42 of the constitution, we should have peace and security before we begin to talk of infrastructure and this is where the need for state police comes in. “It is time for us to see how it has worked in other countries of the world and by so doing more Nigerians would be secured.” Other senators who spoke after him including Senator Kabiru Marafa ( APC Zamfara Central), the Senate minority leader, Godswill Akpabio, Sam Anyanwu, Barnabas Gemade, George Akume etc, also concurred to the need for state police. In addition to the state police argument, Senator Mao Ohuabunwa also called on President Muhammadu Buhari to sign into law the Nigeria Peace Corps Bill before him for enhancement of intelligence gathering and security at the grassroots. In his own contribution, Senator Shehu Sani ( APC Kaduna Central), told his colleagues to call a spade a spade, by declaring that President Buhari as the commander in chief of the nation’s armed forces should be told the bitter truth of non-performance in ensuring security of lives and property of Nigerians. “ This is not the time for diplomacy and courtesy. This is the time to provide leadership for a nation that is in national emergency and national distress. “Let the president wake up and protect the country. We are living in a country where there is complicit reward for violence. “ Things are not going right in this country, we are failing, people are dying in their thousands, kidnappings, violence. “The president should rise up to the occasion. We are shifting blames trying to evade the truth. We cannot solve this problem, Nigerian political class and the political establishment are more interested in the 2019 general elections than the life of our people. They are more interested in the INEC timetable. “There must be a clear distinction between armed herdsmen who must be confronted frontally and Fulani cattle rearers. People have lost hope in the government, we are here trying to massage the ego, we don’t want to confront the presidency and the president because people want to come back to the 9th senate, they don’t want to lose the ticket”, he said. Sani’s submission was reechoed by the Senate President, Bukola Saraki, who in his remarks called on the President to wake up from his slumber and act fast. “The problem of killings across the country is clearly a wakeup call on the President, heads of the security agencies and of course the government as a whole to urgently do the needful”, he said.